When you walk outside into sweltering heat or biting cold, your body responds by sweating or shivering to regulate body temperature. It starts with cells in your skin called thermoreceptor neurons, which sense the temperature of your environment and send that information to the brain for processing. But how does the brain process this information to initiate behavioral responses such as sweating, shivering, or pulling your hand from a hot pan? Two studies published together in Nature have mapped the brain’s representation of temperature in fruit flies, and the findings will provide more insights into how our own human bodies tick. Fruit flies are a great model for studying how the brain processes temperature. Because even a small temperature change can be deadly to these tiny insects (they can’t regulate their own body temperature internally), fruit flies need a quick and efficient system for sensing dangerous temperatures and escaping. Although humans have more options for responding to uncomfortable temperatures, the brain’s logic for representing temperature is likely similar in both species. Previously, fly researchers had found that fruit flies have “hot” and “cold” thermoreceptor neurons in their antenna, similar to the ones we have in our skin. The “hot cells” are activated by heat while the “cold cells” are activated by cold. Interestingly, each cell type is also inhibited by the other temperature—heat makes it harder for cold cells to be activated, and vice versa. Thermoreceptor neurons from the antenna relay temperature signals to projection neurons in the brain. Image modified from Florence and Reiser, 2015. These thermoreceptor neurons are the first step for temperature sensing in the fruit fly, but what’s the next step? How does this temperature information get processed in the brain? In their recently published papers, Frank et al. and Liu et al. used different approaches to answer these questions. Both groups independently discovered neurons that receive information from the hot and cold cells in the antenna and carry it to the brain. 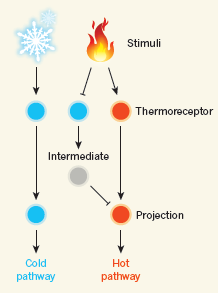 These cells, called projection neurons (PNs), can be separated into three main groups: cold-PNs, which are activated by the cold thermoreceptor neurons; hot-PNs activated by the hot thermoreceptor neurons; and mixed-PNs, which receive information from both types of thermoreceptor neurons and are activated by rapid temperature changes in both directions. Frank and colleagues found that the mixed-PNs were important for fruit flies to recognize and quickly escape from dangerous temperature environments. 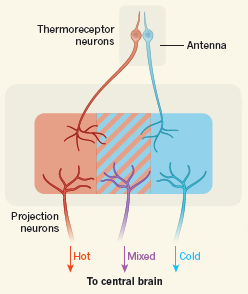 Cold projection neurons are directly activated by cold thermoreceptor neurons. In contract, hot projection neurons are not only directly activated by hot thermoreceptor neurons, but also indirectly activated when the cold pathway is inhibited by heat. Image modified from Florence and Reiser, 2015. These results suggest that the fruit flies’ temperature-sensing system is relatively straightforward: hot and cold information each has its own pathway to the brain. In a small group of PNs, this information also overlaps to provide the brain with a quick escape warning, regardless of whether the dangerous temperature is too high or low. Liu et al. revealed that hot projection neurons exploit both the excitatory ‘getting hotter’ signal from the hot receptors and the inhibitory ‘getting less cold’ signal from the cold receptors, and suggest that this not-quite-redundant use of both pathways leads to more-sensitive measurements of temperature change. So what happens to the temperature information after the PNs carry it to the brain? Both groups found that the PNs connect with brain regions important for learned and instinctual behaviors. The next research step will therefore be to uncover the processes by which these brain regions initiate behaviors to protect the fly—whether it be a simple quick escape, or storing a memory of a dangerous place.